This simple brunch dish has taken off in recent years. Now one of the most popular offerings on any menu, avocado on toast is a must-have for any brunch. No matter what your bread, from simple wheat bread to sourdough, the topping of smashed avocado makes the perfect savoury treat. To match this, look for a Sauvignon Blanc as a great starting point. It is the perfect wine for the avocado ensemble as it plays up the green theme and adds well-needed acidity – like a squeeze of lemon. If you’re in the mood for a sweat treat this brunch, look no further than blueberry pancakes. These fluffy offerings are light and full of sweet blueberry flavours. Although delicious, they can mean that you’re facing a lot of dough. To combat this, your wine should be light and sweet to match the dish. A Moscato d’Asti is a vibrant wine, with flavours of nectarine, honey and peach acting as the perfect complement to this berry-heavy dish. Eggs Benedict is a brunch classic. It’s a perfectly toasted English muffin halves topped with crispy bacon, a perfectly poached egg, and a generous pour of creamy hollandaise sauce – a delicious addition to any brunch. With the creamy flavours and variety of flavours on offer, you may think it’s a hard dish to pair, but it all comes down to knowing what you’re looking for. Importantly, you should be adding sweetness to your dish – but not too much. The perfect choice would be an Extra Dry Prosecco. Bringing just a hint of sweetness, the fruit flavours in this crisp wine bring an ideal balance to the dish. With its acidity, you’ll even find your palate cleansed between bites. 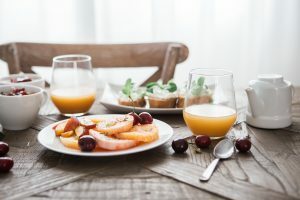 It’s a breakfast and brunch dish that has been enjoyed for decades – but has recently started gaining traction as a popular food trend. With a base of yogurt and a wide range on toppings on offer, from bananas to honey, this healthy option is a great alternative if you’re looking for something lighter. For this pairing, you should focus on a wine with strong aromatics. This is because yogurt offers very little in the way of aromas, and thus, aromatic wines can really add more perceived flavour to the dish. Gewürztraminer with its intense aromas of lychee, rose, grapefruit and allspice will really take your everyday yogurt bowl to the next level. 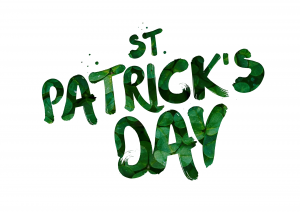 If you still want to celebrate St Patrick’s Day, but prefer to drink something else – here’s what we recommend. There’s no food more quintessentially Irish than an Irish beef stew! Although there are many variations on this classic dish, the most popular contains succulent cubes of beef and hearty roots vegetables. This warming dish is full of flavour – so needs a wine that equally packs a punch. As it’s made with beef, a red wine will work perfectly. We recommend trying an Italian Aglianico, a full-bodied red with rich tannins. This wine is a perfect match for the hearty and rich stew. The savoury, earthy and gamey flavours of the wine are the perfect complement to both the root vegetables and meat. This comforting paring is sure to warm you up! Boxty – or Irish pancakes – are a traditional potato pancake made with mashed and/or grated potatoes. These are often served early in the day and are the perfect platform for loading with a variety of toppings. Although you can top your pancake with anything, a great wine to make the potato base is a classic Chardonnay. The undertones of apple, lemon and pineapple in the wine will add depth to the mild flavours of the potato, without overwhelming the pancake. The sharp crispness of the wine will ensure that your dish remains light. It’s the ideal palate cleanser! As one of the heartiest dishes Ireland has to offer, a classic Shepherd’s Pie needs to be carefully paired. Consisting of seasoned minced lamb and vegetables and topped with mashed potatoes, this spiced and fragrant dish is full of flavour. To match this, opt for a classic food-pairing wine: Sangiovese. As the main grape of Chianti, it is a lively and acidic wine. With moderate tannins and savoury notes, Sangiovese will balance the richness of the spiced lamb. On a cold day, look no further than potato and leek soup. The richness of soft potatoes with heavy cream balanced out by the savoury bit of sautéed leeks is the perfect comfort food. If you’re looking to serve this dish on St Patrick’s Day with wine, always look for a crisp white. Our recommendation is a delicious Grüner Veltliner. The elevated acidity of this wine will help to cut through the creamy weightiness of the soup, refreshing your palate between spoonfuls. As well, its classic peppery, green notes will complement the botanical flavour profiles of the leeks and any other herbs added. Look for high acidity and herbaceous notes and you can’t go wrong! If you’re looking for more than Guinness and whiskey to pair with your food this St Patrick’s Day, wine is an excellent choice. This is a day for celebrating – there’s no better excuse than to open a bottle! Lasagna, the great Italian comfort food, is always a crowd pleaser. The layers of pasta, meat and sauce always go down well. But did you know there are so many types of lasagne? Beyond the traditional tomato and béchamel variety, there is a wide range of varieties that include a creamy white sauce and a pesto-driven option. This week, Ideal Wine Company is showing you some of our favourite lasagnes and what wine to serve with them. Perhaps the most common type of lasagna, red lasagne is usually the first variety to come to mind. With its traditional tomato and béchamel sauce combination, it is stuffed with mozzarella, ricotta and meat. This hearty and warming meal works well with an equally intense red wine. Try opting for Aglianico, a black grape wine found in the South of Italy. This wine’s high tannin content complements this rich and fatty dish. In addition, the dried fruit flavours and the high acidity work perfectly to cut through the slightly sweet tanginess of the hearty tomato sauce. If you’re looking for something a bit different with your lasagna, a white lasagna, or lasagne blanca, is a great alternative. Rather than using the traditional bolognaise tomato sauce, a white lasagne consists of peas, mushrooms, Italian sausage and a creamy white sauce. With this type of dish, you should be pairing it with a wine like Arneis. This Piedmontese grape is a zingy and lean white wine that acts like a herb. When served with béchamel or other creamy white sauces, it infuses the dish with earthy and unmistakable green notes. With the amount of heavy creaminess in this dish, the wine’s lean and olive driven qualities are sure to cleanse your palette. This pesto-based alternative of traditional lasagne combines parmesan cheese, basil, pine nuts and olive oil. The result is a dish that is full of flavour and aroma. If you’re serving this dish with wine, you can’t go wrong with a Vermentino. This equally lean and green option is dry, a touch oily and just bitter enough to provide the perfect partner to the fragrant lasagna. This Italian white provides the perfect aromatic hints of herby green to complement the pesto. If you’re eating any type of lasagna, Sangiovese is perfect. This really is a one-bottle-suits-all type of wine. 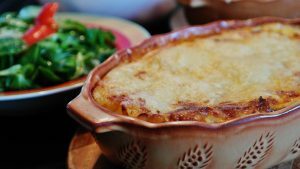 In almost all cases, the tart and savoury wine drinks well with the intensity of lasagna. This is because the high acid and rustic flavours you can expect in Sangiovese will cut through the creamy fat and tangy tomato at the same time. This really is the perfect choice for any type of lasagne. It’s always worth having a bottle to hand next time you make any type of lasagna! No matter what your favourite type of lasagne is, you’ll easily be able to find the perfect wine match. Take a good look at what flavours and textures the sauce is bringing. A good rule to follow is to pair creamy sauces with lean wines and lean sauces with richer offerings. With so many lasagnas to try – and wines to pair them with- you’ll find the perfect choice for you. Find your perfect burger wine pairing! Most of us are familiar with the classic burger, with meat, lettuce, tomato and onion, it’s a universal favourite. The best wine to pair with a classic burger is one that has an element of bitter and sweet, to create the perfect balance. For this, we recommend trying a Grenache. This red wine pairs perfectly with grilled meat and suitably showcases the beef of the burger. The berry-flavour and spice of the wine create a great balance between bitterness and sweetness that rounds out the flavour and is soft on the palate. Similar to the classic burger, but with cheese, bringing tang and creaminess to your meal. When looking for a wine to pair with this, the level of tannin is a key element. This acts as a palate cleanser and lightens the heaviness of the cheese. 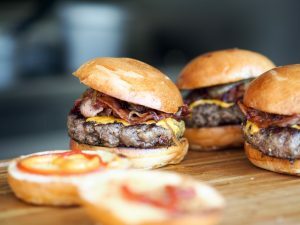 As well, cheeseburgers tend to work well with savoury notes, as this will help to prevent the creaminess of the cheese from becoming overwhelming. Cheeseburgers are perfect with Cabernet. The good levels of tannins in the wine refresh the palate and keep the flavours harmonious. The flavours of tomato, roasted pepper, blackcurrant and dried leather are savoury enough and better complement the cheese and ground beef combination. A perfectly balanced experience! There’s a lot of flavour in a barbecue bacon cheeseburger. Although there is a lot of intensity loaded into each bite, a good rule to follow is to focus on the sauce. With barbecue, you’ll want dark fruit and some spice. For this, there’s no better option than a Syrah. The smoky, earthy red works well to bring together the flavours of the burger. It really showcases the sweetness and spiciness of barbecue sauce and creates a good balance between the two strong flavours. This vegetarian option is made up from grilled mushroom and a slice of nutty and buttery swiss cheese. The earthy flavours of these two key ingredients need to be matched by an earthy sweetness to round out the flavours and lighten the dish. For this, try opting for a Merlot. The fruitiness of the wine is inherently sweeter, which is perfect for pairing with earthy flavours. With aromas of black cherry, berries, plum, chocolate and some herbs, as well as soft characteristics, a Merlot won’t overpower the subtle flavours of mushroom and swiss cheese. When it comes to burgers, there are plenty more to choose from. A good final tip is to stick to red wines when the meat is beef and consider the sauce on the burger when looking for the perfect pair. White’s work well with white meat and you can pair both white and red well with vegetarian burgers. We all know the classic pairings for Champagne. From caviar to oysters, these traditional options are tried and tested delights. But why not try something new or perhaps a little unusual? 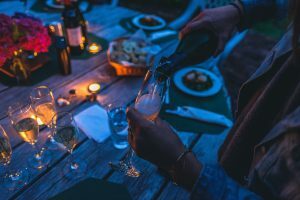 There are a wide range of foods that pair perfectly with Champagne and step outside the ordinary. This week, Ideal Wine Company brings you some alternative ways to pair Champagne with food. We all know the classic pairings for Champagne, but here are some alternative ways to pair Champagne with food. When thinking of food to serve with Champagne, macaroni cheese may not be the obvious first choice. But when the balance of flavours is right, these two work together incredibly well. There are a few important variables to perfect with your pasta before this can work. Make sure that your cheese is not too sharp, so consider opting for a softer creamy cheese with flavour. A good smoked gouda is perfect. When it comes to the Champagne, your wine needs to be acidic enough to cut through the cheese. Balance is key to pairing Champagne and macaroni cheese, but a great rule of thumb is to keep the cheese soft and let the wine be slightly bolder. The perfect comforting pairing! This popular dish is often a snack or starter and can make a surprisingly good pair for Champagne. The goal of this balance is to reduce the fat of the spring rolls and increase the lightness of the vegetables. To do this, look for a Champagne with low acidity and opt for a big bubble finesse. A good rule to remember for pairing spring rolls and Champagne is to meet spiciness with sweetness. The more heat you add, the sweeter your Champagne should be. This provides a delicious balance that is unexpected but delicious. Although it may sound unusual, Champagne and fried foods are the perfect pairing. The greasy richness of these foods is elevated by the sweet bubbles of Champagne. A great example of this is fried mushrooms. Try opting for a Blanc de Noirs, a white sparkling wine made with dark grapes such as Pinot Noir. The earthiness found in mushrooms is complemented by the rich fruity and earthy notes that can be found in options such as a Blanc de Noir. A slight sweetness will go a long way in lightening this dish. Fish tacos present a wide range of flavours. From zingy lightness provided by the limes to the heat of the chilli to the subtly of the fish, there is a careful balancing act of flavours in place. A super dry and crisp Champagne will fit perfectly into this. These wines have little or no added sugar, meaning they’ll keep up with the zesty flavour of the dish. If the fish has lime or salsa added to it, it’s key that you find a Champagne with even higher acids. This means the wine will taste bright. As well as this, look for a good sharpness and minerality prevents the wine from tasting too flat. With a good balance, Champagne and fish tacos create a light and lively pairing. Don’t be afraid to ‘think outside the box’ when it comes to your Champagne pairings. While the classics work well, there are plenty of alternative pairings that can widen your use of Champagne. There’s no longer any need to save the Champagne for special occasions!